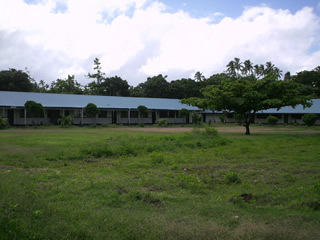 TAUFA'AHAU PILOLEVU KOLISI is the main Wesleyan school in Ha'apai. 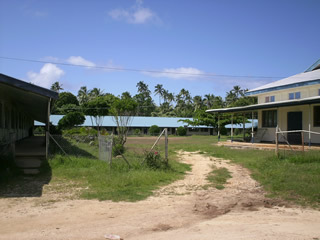 Here in Tonga, a Kolisi (College) is a boarding school, where the majority of the students live on campus during classes and go home during the breaks. The school year in the southern hemisphere, begins in January and ends in November. There are breaks in March (fall), June (winter) and September (spring). I made this webpage in March during the fall break, thus the lack of students in the pictures. In this topsy-turvy southern hemisphere the strangest part for me is how the sun is moving lower to the North as winter approaches. Here is a map of the Taufa'ahau campus area in Pangai. The wide lines are roads and the little red triangles show where some of the pictures were taken from. The little blue squares are houses where some of the teachers and staff live. The larger blue boxes are the major buildings that make up the campus. There were 186 students in classes in 2007 when I taught there. The classes are from kindergarten up through Form 6, which is the same as K-12 in the USA. It is a British school organizational system, and thus the Kolisi or College is more like a high school, but one finds that the students are a bit older than the corresponding high school level. There is a Form 7 which is not offered at Taufa'ahau. I compare that to a US preparatory school, between high school and university study for the academic student. 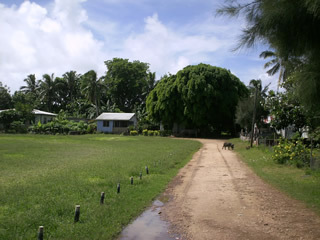 An academic track in Tonga beyond form 6 is more complex than in the USA. There are many diploma and certificate programs offered within Tonga but these are not internationally accredited programs. Frankly they are not very good, and students who seek an accredited degree program will be looking to relocate overseas, or to begin their matriculation here in Tonga through a partnership with an accredited school overseas. Such programs are now growing significantly, with students in them a bit more serious about their education than many USA college students. It is now possible for a Tongan to earn an accredited Bachelor's degree, but they will currently have to relocate overseas for the final semesters of school. 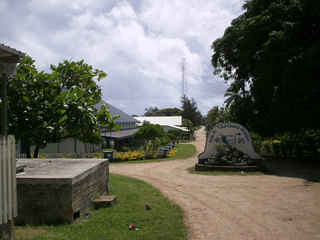 Some of the Kolisi teachers are taking classes at the University of South Pacific center. 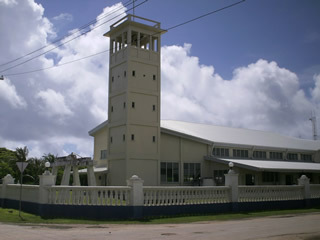 USP is based in Suva, Fiji, and offers classes in 12 nations of the Oceania area but they don't offer music classes at all. Mostly a student will relocate to Fiji to complete their degree, where there are several mini-communities of expats who support each other. I find that Tongans who go this route seem to have had too much help from their little support group, a problem that is found in most native education program communities. The emphasis is to assist each other to get that diploma, not to get that education per se. Frankly these programs are not very good either, but they are internationally accredited degrees. I used to teach USP classes at the Form 7 level when I taught at Tupou Tertiary Institute. On the right is pic1 showing the entry area to the classrooms. To the right is the Library and on the left nearest the road is the main offices. Further down is the staff room and computer classroom, and behind them are the upper classes. The building at the back of this photo holds the lower classes, science classroom and the bookroom. Behind the library from this view is the industrial arts and home economics building. Pic2 shows the classrooms and the grounds in the center of the classroom area. I remember that tree was a lot smaller when I first came here in 2004! Back in that corner there are two huge cement tanks holding rainwater. There are many of these here for drinking water. There is a well behind the hall that is pumped to a water tower which supplies running water to all the houses. I use the tap water for brushing my teeth and washing dishes while in Tonga, but the rainwater makes a better quality tea (I drink a lot of ice tea). There is (mostly) no hot water in Tonga. My friend Lesieli swears the rainwater is better for washing hair and clothes, and I have learned that she is correct. This view pic3 is looking down the road from the classrooms. Out of the picture on the left is the kindergarten and on the right is the girls dorm. Down the way is the hall and the church office. You can see the communications tower further down. That provides the internet using a Motorola Canopy broadband access point. Unlike Nuku'alofa, which has broadband service from Fiji by undersea cables, Ha'apai has only satellite links. Ha'apai's satellite link provides about 1.2 Mbs downlink (600K up) which is shared with all the mobile phone traffic. TPC has 128K/64K (dn/up) service, but I get a burst now and then up to 300K. You can almost see the ocean at the end of the road. The fishing jetty is right there at the end of this road. Here in pic4 are staff housing and the sports grounds. My house was the one under that huge tree. Yes that is a pig in the road. These are the domestic kind and they are free to wander around everywhere throughout Tonga. You would try to keep them out of the yards and gardens but they are very smart animals, those pigs. Same goes for the chickens, although not as smart as the pigs, they do fly a little bit now and then. Oh yes, and all the dogs. They bark all night and fight each other but at least they eat up all the garbage. Out of the picture on the left is the boys dorm and at the right out of view is the preschool grounds. Since it was fall break the grounds are a bit shaggy. Here is the church in pic5. It is a beautiful building, befitting it's central position in life here. Down in the corner in front there is a huge bell which rings 1 hour before service, again 5 minutes before, and right at the beginning of church services. There are services at dawn, at 10am (the regular one) and at 5pm on Sunday. If you forget the schedule, just listen for the bell.